Railway Recruitment Board, Secundarabad has released notice asking all government employees applying for RRB N TPC 2015 to produce “No Objection Certificate” as part of recruitment process for Job notification NTPC (G) of CEN. 03/2015. The notice is for Railway recruitment of CEN. 03.2015 that is ongoing. 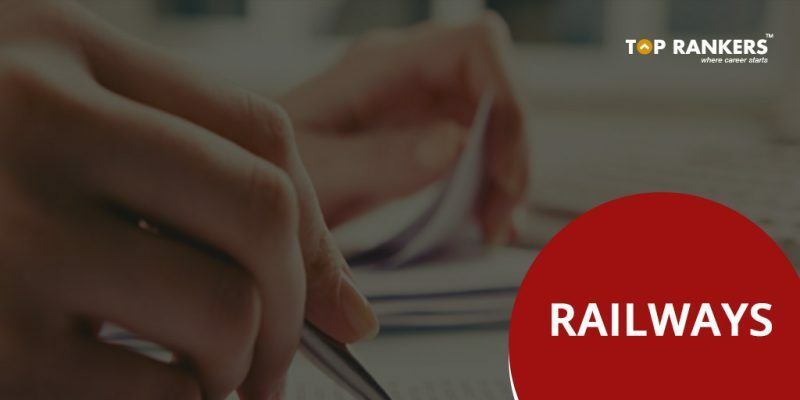 Candidates who are currently working in government offices and are applying for Posts in RRB or Railway Recruitment board must produce the NOC Certificate before 10th November. 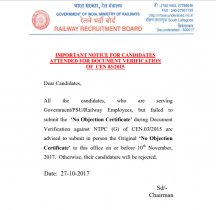 All the candidates, who are serving Government/PSU/Railway Employees, but failed to submit the ‘No Objection Certificate’ during Document Verification against NTPC (G) of CEN.03/2015 are advised to submit in person the Original ‘No Objection Certificate’ to this office on or before 10th November, 2017. Otherwise, their candidature will be rejected. Stay tuned for more updates on RRB Notice regarding NOC for Serving Govt. Employees!